who put blue paint down the storm sewer? 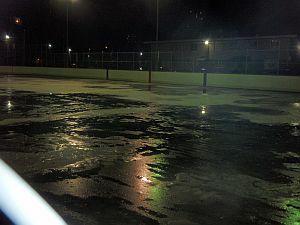 Regent South Rink is one of the 14 rinks listed for opening tomorrow, but it's clear they won't be. 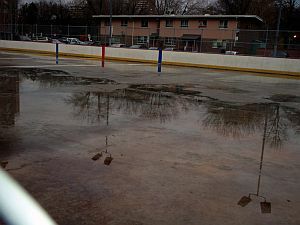 The compressors are on and there's lots of water ion the rink, as well little islands of ice, but the cement is clearly visible. The rink guard supervisor is inside, trying to clean up -- the rink change area was repainted in blue and white, all the lockers are gone, and there are some new benches, as well as some lumber stacked in the middle of the room. 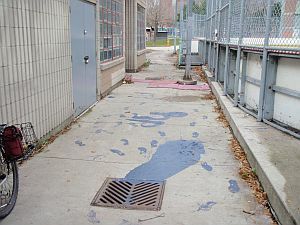 Outside the front doors there are blue-paint footprints and a big semi-dry puddle of blue paint clearly leading into the storm sewer. There's no signage about when the rink will open. 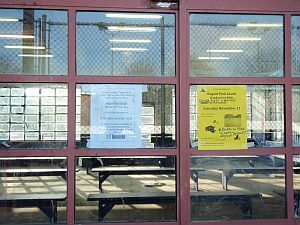 There's a paper sign on the door, saying "weather permitting" the rink will open on Wednesday Nov.25. But there's no sign of anyone trying to make ice -- there's less water and more islands of concrete than before. I post a sign beside the other one, asking "what happened? 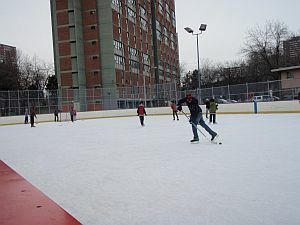 Dufferin Rink is open, why not Regent?" 2.30 pm: No one on site. There is a sign up that says "rink will open Nov 25th". This seems unlikely. The compressors are on but no ice has formed as far as I can tell. There is a fair bit of water (and dirt and debris like leaves) on the pad. The gates are locked so I can't be sure that there is no ice under the water but I don't see any. Although it's dark on the rink, it's easy to see that no more work has been done on it. 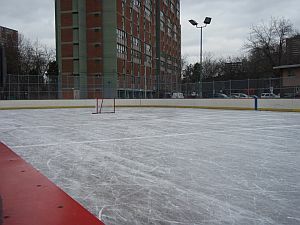 Meanwhile Dufferin Rink is full of skaters, whereas this rink is deserted. There is never anyone working at this rink, it seems. The compressors are still on, and since there was some rain, a few patches have frozen. But there's nothing to bridge the patches together. 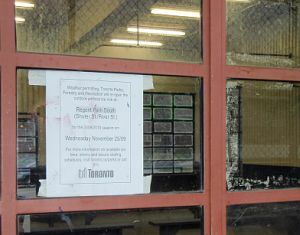 The "Weather permitting, Nov.25" sign is still up, but the one I put up has been removed. There must have been some flooding right after the last entry -- because today the news came that Regent South is open. At 1 pm there are two skaters in the rink house, plus one rink building attendant. They say that the lunchtime skaters from Nelson Mandela School just left. 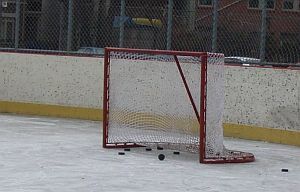 The rink's puck collection is still in the net -- the building attendant says he keeps a collection of pucks for when the school comes or when people come with no puck. When told that Dufferin Rink sells skate laces as well as pucks and tape, they laugh. "If you break a skate lace, you just tie it back together. Or use duct tape." The building attendant says that the big primary school next door has had a hockey team for some years, which uses this rink to practice. Kids also come over from there in their phys ed times, just to skate around. He's not sure if the school has a skate collection fro kids who don't have their own. He mentions that the NHL Players' Association donated some hockey sets to the nearby Wellesley Community Centre. These sets were given out to kids who couldn't afford their own equipment. But the days when the recreation staff ran a hockey program and set up tourneys are over. The rink change areas has only benches,not even one table, no board games, no food, no lockers. The building attendant says that the rink is meant for sports, not for socializing -- hinting since the social activities that might happen there would not be good ones. He does say that families come out to the rinks on weekends, and that they might enjoy having some food at the rink. But on weekdays, family use is not so much. As I leave, five more hockey players get onto the ice. They look like they might be people on lunch or on shift work. Numbers at 2.45: 14 shinny hockey players, three pleasure-skaters, 8 inside. Staff: one building attendant. This rink has the feel of a real neighbourhood rink. On the rink there were mostly younger kids and youth but also some older players who slowed down around the kids learning how to skate while holding on to the fence. Inside there were some young girls, several wearing hijabs, just taking off their skates. 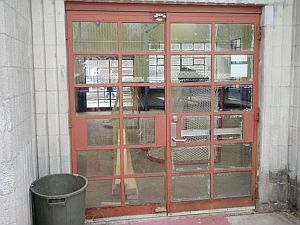 The building attendant said that last winter there was a fun fair at the rink which attracted lots of kids. At 12.30 pm the rink is full of lunchtime hockey players from Nelson Mandala School. Their phys ed teacher, Shaka Abdul-Rashid, says they come over most lunchtimes for extra practice, and he's there with phys ed classes all day on Tuesdays. The school has a room for the skate collection, so that no kid needs to be without skates. And on Tuesdays, they get a lot of help from a woman named Laura Levtov, who runs a skating school called funskate. They said she even brings her instructors, without charge. The Regent South rink attendant says they have more skates in a storage room at the rink, so that kids who have outgrown their skates can trade them in there. He said that somebody donated a skate sharpener but they've never used it -- there may be some parts missing. It would be good to get that going, with the volume of kids skating over there, through the school. They said also get skate sharpening and equipment through the Hockey Heroes program at Moss Park Arena. It all looks like pretty much fun. 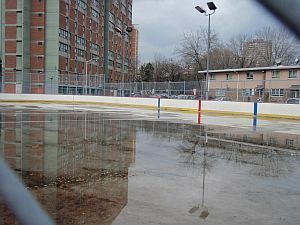 I am writing in regards to the rink at Regent Park South and the shinny times. I have gone a few times in the afternoon when adult shinny was suppose be taking place and instead there were skating lessons taking place on the ice. Is there a new schedule out that I am not aware of or do the kids take precedence over adults? I can understand if the schedule has been changed, but if there are 20 of us out there and the shinny time is 1pm-3pm and kids show up at 1:30pm, who has the right to the ice? Just thought I would bring this problem to your attention.